I write about families; many people wish I wouldn't. But in a sense families are all we've got, even though they may be extremely problematical, either safe havens, repositories of tawdry secrets, or something in between. And yes, each unhappy family is unhappy in its own way. My family seemed happy enough, held together by a quite remarkable mother, a person of rare intelligence and understanding. When she died, everything changed, and eventually my father rejected his two children. My brother and I take no responsibility for this estrangement, and our father need not either, for old age, ill health, and rash decisions can alter lives irreparably. And sometimes irrevocably. The kaleidoscope. Quite suddenly and recently, circumstances changed yet again. My brother went to visit our father. And then my turn came. We drove through the leafy avenues near the city, and I heard again the comforting click and chime of trams. Melbourne was baking in summer heat and dust; a strong northerly blew small eddies of rubbish and leaves along the broad streets. I felt that I had never been away. Through tunnels and along freeways we went to the nursing home. I felt as sick as a dog and was doing a fair imitation of a cat on hot bricks; I was also jet-lagged and weary. Would Dad recognise me? It had been more than seven years, after all, and he had recently been diagnosed with dementia. If he did recognise me, what then? Would he be pleased, or would he fall into a rage and start roaring in well-remembered fashion? There was nothing for it but to find out. Like childbirth, I told myself, the only way out was through. Some of the residents were watching a film, we were told, and Dad was one of them. We were taken through chintzy lounges to the darkened projection room. My brother moved to one side, while I stood peering into the gloom. By dint of concentrating, I eventually saw a very old man being helped to his feet. I suppose I was clearly visible. I also suppose I will never forget that moment and the moments that followed. At least not for a very long time. Dad's jaw dropped, and then he broke into his familiar wide grin. He waved, and then came slowly towards me, pushing his walker in front of him. Once outside the door he took a couple of steps further. 'Hullo, Dad', I managed to say, although I now wonder how the words emerged from my constricted throat. He grabbed me and wept; I grabbed him back and wept, too. When we finally let each other go, I could see that my brother's dark eyes were filled with tears. 'I suppose we all are from time to time, but so what?' I replied. His voice had not diminished in strength, and the truculent tone had not changed. We three then sat in the guest lounge, trying as best we could to catch up, to plug the enormous gap in time, to mend the frayed connection. Dad worked his way steadily through a box of his favourite chocolates, while we attempted to prod his memory and succeeded, at least to a certain extent. I had brought some photos, not knowing at all whether this was the right thing to do. But it turned out to be. Dad knew most people from his past, predictably recognising his parents and aunts more easily than his nieces and nephews. I wondered whether I should show him the photo of his first wedding, but I did. There they were, 65 years previously, our Mum and Dad, he laughingly proud and in uniform, she smiling sweetly, shyly, through mists of tulle, and leaning into his shoulder. At that moment, Dad's moment of sighting, I had to turn away and blink rapidly. For he said, very quietly and wonderingly, 'God, she was beautiful'. We left soon afterwards: Dad was tired. 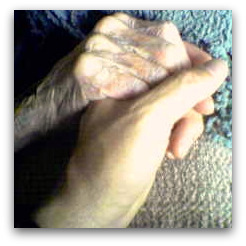 While saying goodbye, I held his hand, feeling relieved and thankful beyond measure. 'I hope all this has not been too much of a shock, Dad', I said. He looked at me and smiled the smile I had missed so much. Please keep on writing about family! That was just beautiful. I do rejoice for you. My best Christmas present this year was to find that my efforts in bringing a mother and daughter together again had succeeded. The mother is dying of cancer but at least they are together again. Thank you Gillian for another moving article, made all the more so when I read your previous articles about losing your dad and your sister's suicide. I rejoice with you in this reconciliation and pray for all those who have also 'lost' loved ones still alive. Thanks so much Gilliam for letting me (and all your readers) hear the next chapter in your story. It was wonderful, and so unexpected, given all I've heard before. Repemptive hope? Is that what you offer us? Maybe I'll start believing that American politics can be rescued too! Great piece. Yes, most of the great comedies and dramas in our lives are acted out within our families. One way to try to make sense of it all is through shaping them into stories. Thanks for offering them to us Gillian. Thank you again. As with every article of your's that I have read, and I hope I haven't missed any, I foubd this uplifting, hopefilled and inspiring.I could visualize your father you and your brother, though I have not met any of you.Please continue to write about family. Moving. I am so happy for Gillian and her father. It sounds like a miracle after years of frustration and disappointment. Love and peace gained a victory, at long last. I'd wish that in many problematic families reunions like this one would happen. My father is in the late stages of dementia after 5 years. He is a physicist of world standing, respected in the community, gentle and loving to all his family members. The hardest aspect of relating to a loved one is to realise that there are various stages of awareness of the relationship and these may vary as the disease progresses.There is no set way that the various deteriorating functions atrophy as each patient is different. Some of the former bad aspects may also vanish! You are to be commended for deciding to renew your relationship.One should never be anxious about the level of feedback received; as someone else may be told out of your presence, and maybe in some distant time.One needs to relax optimistically. You will find the website of Alzeihmers Australia extremely helpful, and make time to link in with your nearest branch and attend some of the functions/awareness groups. For a very long time I thought I would never see my father again. Miracles do happen: that's the way I feel about this unexpected reunion, anyhow. Many thanks to all the people who have supported me during long years. Thank you to the known and unknown readers who have taken the time and trouble to write in. This is a heart rendering and amazing story Gillian. I am pleased for you both and your brother that it ended like it did, or is this really the end? Whatever brought about his change! Dear Gillian, I love your stories about family, Greece and everything. I met your parents through a support group in the eastern suburbs of Melbourne (late 1970s - mid 1980s). Your very special mother attended regularly, and your father came along for festive occasions. They were both clever, kind people, and spoke lovingly about your sister. They were worried about another daughter about to leave for Greece. Time passes. Our family is filled with similar illnesses and only two of our three sons passed the quarter-century. All of our dead are special to us, and leave an indelible mark. Do continue your writing; I look for it often in Eureka Street. What a moving, heartfelt and, my God, honest piece. Many thanks for sharing it with us. From the moment of Malik's imprisonment he finds that if he is to survive, he needs to choose between conflicting evils. His Muslim roots appear from time to time, but while these moments lend transcendence to the film, they give no moral credence to Malik's actions. Black stumps, capped with snow — no, capped with lime, beside the road, tree ferns, fanning their wing in the sun. A sign: children crossing. The road is so large. The CFA building, those three letters almost the three sides of a cross.